Is there Really Good & Evil? 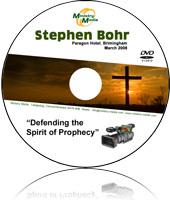 Single DVD message by Pastor Stephen Bohr. Recorded at "ADVANCE" Adventist Apologetics Networking Conference of Evangelism. NEC Youth meeting at The Paragon Hotel, Birmingham March 2008. What is the Spirit of Prophecy? watch this DVD and see what it is. It is a gift that God has given us. Pastor Bohr says the Spirit of Prophecy is the eyes of God's remnant Church. He goes through some great events of Bible history, and explains many time prophecies that run through the Bible and how God imparts them to His prophets starting at Enoch right through to our day.